Now HERE is an interesting chart. It depicts the market shares each smartphone company controls, in terms of number of subscribers. As you can see, in the past year or so the Android OS ("Google") has seen an astounding increase in market share. 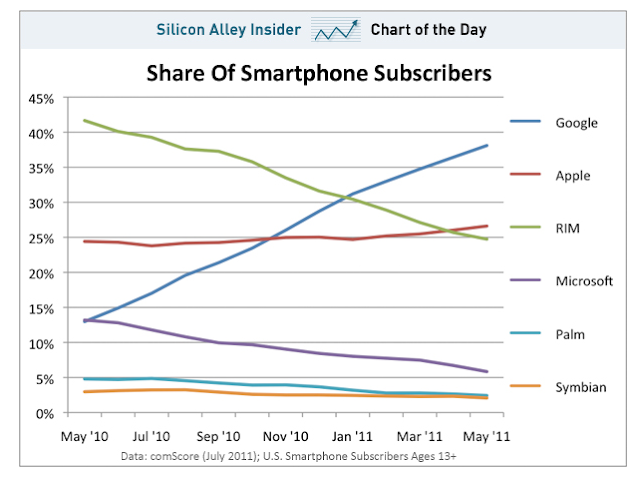 From May '10 to May '11, the share of Google phones has gone from 13% to nearly 40%! The flip-side of this meteoric rise is the precipitous decline that RIM has experienced, dropping from about 43% to 25%. Apple has increased their share ever so slightly in this time frame. With a flood of hot new Android OS phones hitting the market, I can only imagine that the market share gaps apparent in this graph will continue to widen.